DIE Mercurii, videlicet, 10 die Augusti. Message from the H. C. for the Lords to concun in the following Orders, &c.
Butler, etc, Irish Prisoners in Newgate, for Relief. Message from the H. C. for L. Say and Seale to be L. Lieutenant of Gloucestershire. E. of Carlile sent for as a Delinquent, for attempting to execute the Commission of Array in Essex. 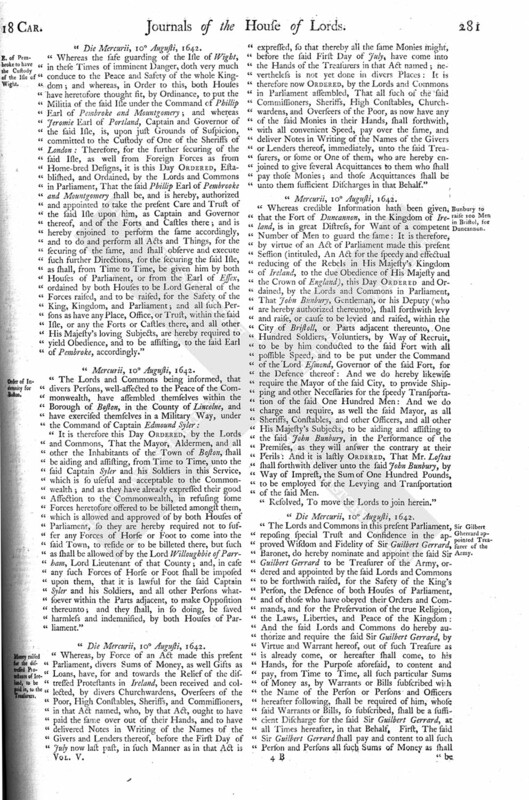 Resolutions concerning the Lord Mayor. and with an Order, etc. for the Lords Concurrence. Mr. Herbert to repair to Monmouth, and possess that County of the Declaration, etc. E. of Pembroke to have the Custody of the Isle of Wight. Order of Indemnity for Boston. Money raised for the distressed Protestants of Ireland, to be paid in, to the Treasurers. Bunbury to raise 100 Men in Bristol, for Duncannon. Sir Gilbert Gherrard appointed Treasurer of the Army. Ordered, That this House agrees with the House of Commons in this Ordinance, concerning Sir Gilbert Gherrard. 3. In Instructions for Monmouthshire. Also an Ordinance for Henry Herbert to publish the Declaration against the Commission of Array, etc. 4. To desire Expedition in an Order formerly brought up, concerning the Fort of Dungannon, in Ireland. 5. 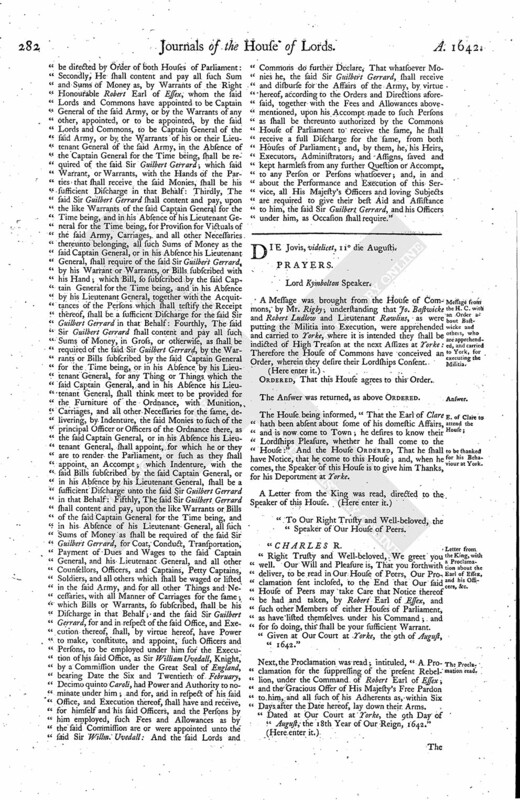 An Ordinance to nominate Captain Vernon to be Deputy Treasurer. Laid aside. Sir Gilbert Gherrard to appoint such himself as he shall conside in. 6. An Order concerning authorizing the Sheriffs and Commissioners to demand the Money of Subscriptions. That this House agrees to the Ordinance concerning Sir Gilbert Gherrard, and to the Ordinance concerning Mr. Herbert, and the Order concerning the Fort of Duncannon, and the Order to authorize the Commissioners to demand the Money of Subscription. 1. An Act for the Indemnity of Phillip Earl of Pembrooke and Mountgomery, and the Lady Anne his Wife, etc. In the 92d Line, leave out the Words ["Spiritual and"]. In the 93d Line, leave out the Word ["Spiritual"], and the Word [" the"] before [" Commons"]. 2. An Act for Naturalizing of Ricd. Bogan, & al. In the 31st Line, leave out the Word ["Spiritual"]; and, in the 32d Line, the Words [" and Temporal"], and the Word [" the] before [" Commons]. 3. And Act for the Naturalizing of Jo. Kirke, & al. In the 19th Line, leave out the Words [" Spiritual and Temporal"], and the Word [" the"] before [" Commons"]. Ordered, That this House agrees with the House of Commons in these Amendments. The Petition of Edmund Butler, and divers other Irishmen in Newgate, where they want Means; they desire this House, that some Course may be taken for their Relief. Ordered, To be recommended to the House of Commons. That the County of Glocester, in these distracted Times, is without a Lord Lieutenant: The House of Commons have therefore nominated and approved of the Lord Viscount Say & Seale to be Lord Lieutenant of the County of Gloucester; and the House of Commons desires their Lordships to join with them therein. Ordered, That this House agrees with the House of Commons, in nominating the Lord Viscount Say & Seale to be Lord Lieutenant of the County of Gloucester. The House being informed, "That the Earl of Carlile is at Waltham-Abby, and intends to set up the Commission of Array, if he had not found that the Country would have opposed him;" which being a great Affront to the Parliament, it is Ordered, That the Gentleman Usher shall bring the Earl of Carlile, as a Delinquent, to this House. "That the Lord Mayor caused the illegal Proclamation for the Commission of Array to be published. "That the Petition, charged in the Impeachment to be sent to the King, was by the Lord Mayor's Procurement sent to the King. "That the Lord Mayor did not suppress this Riot, but did countenance it. "That the Lord Mayor did refuse to call a Common Council, at that Time when both Houses of Parliament did command him to do it." "1. That Sir Ric. Gurney, Knight and Baronet, Lord Mayor of the City of London, shall be no longer Lord Mayor of London; and that he shall hereafter be uncapable to bear any Office in the City of London. "2. That he shall be imprisoned in The Tower of London, during the Pleasure of this House. "3. That he shall be made uncapable to bear or receive any further Honour hereafter." Ordered, That Judgement shall be pronounced upon the Lord Mayor To-morrow Morning. 1. That they have nominated the Earl of Pembrooke to be Lord Lieutenant of the County of Kent; and they desire their Lordships Concurrence therein. 2. They desire that the Earl of Pembrooke, Lord Lieutenant of Wilts, and the Earl of Bedford, Lord Lieutenant of the County of Bedford, may be sent down into the several Counties, for the Preservation of the Peace. Ordered, To be considered of To-morrow. Ordered, That this House agrees to these Instructions. That this House agrees with the House of Commons, that the Earl of Pembrooke shall be Lord Lieutenant for Kent, and in the Order of Indemnity for the Voluntiers of Boston. To the rest of the Particulars, this House will send an Answer, by Messengers of their own. 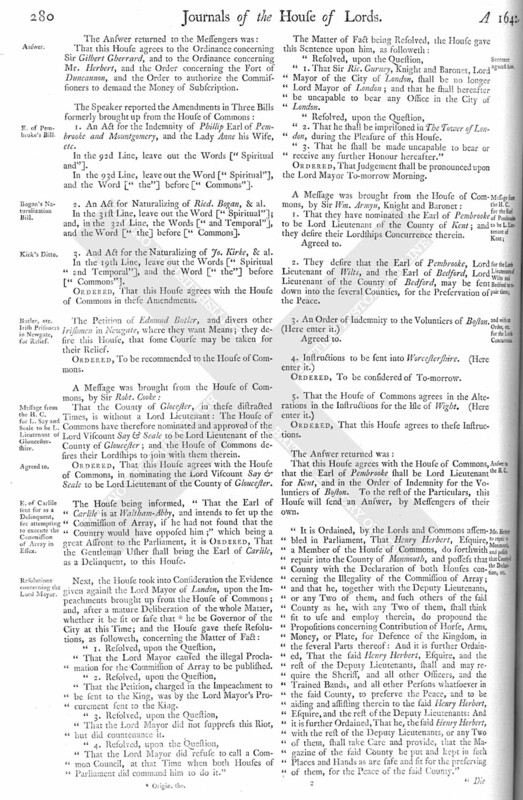 "It is Ordained, by the Lords and Commons assembled in Parliament, That Henry Herbert, Esquire, a Member of the House of Commons, do forthwith repair into the County of Monmouth, and possess that County with the Declaration of both Houses concerning the Illegality of the Commission of Array; and that he, together with the Deputy Lieutenants, or any Two of them, and such others of the said County as he, with any Two of them, shall think sit to use and employ therein, do propound the Propositions concerning Contribution of Horse, Arms, Money, or Plate, for Defence of the Kingdom, in the several Parts thereof: And it is further Ordained, That the said Henry Herbert, Esquire, and the rest of the Deputy Lieutenants, shall and may require the Sheriff, and all other Officers, and the Trained Bands, and all other Persons whatsoever in the said County, to preserve the Peace, and to be aiding and assisting therein to the said Henry Herbert, Esquire, and the rest of the Deputy Lieutenants: And it is further Ordained, That he, the said Henry Herbert, with the rest of the Deputy Lieutenants, or any Two of them, shall take Care and provide, that the Magazine of the said County be put and kept in such Places and Hands as are safe and sit for the preserving of them, for the Peace of the said County." "Die Mercurii, 10 Augusti, 1642. "Whereas the safe guarding of the Isle of Wight, in these Times of imminent Danger, doth very much conduce to the Peace and Safety of the whole Kingdom; and whereas, in Order to this, both Houses have heretofore thought fit, by Ordinance, to put the Militia of the said Isle under the Command of Phillip Earl of Pembroke and Mountgomery; and whereas Jeromie Earl of Portland, Captain and Governor of the said Isle, is, upon just Grounds of Suspicion, committed to the Custody of One of the Sheriffs of London: Therefore, for the further securing of the said Isle, as well from Foreign Forces as from Home-bred Designs, it is this Day Ordered, Established, and Ordained, by the Lords and Commons in Parliament, That the said Phillip Earl of Pembroke and Mountgomery shall be, and is hereby, authorized and appointed to take the present Care and Trust of the said Isle upon him, as Captain and Governor thereof, and of the Forts and Castles there; and is hereby enjoined to perform the same accordingly, and to do and perform all Acts and Things, for the securing of the same, and shall observe and execute such further Directions, for the securing the said Isle, as shall, from Time to Time, be given him by both Houses of Parliament, or from the Earl of Essex, ordained by both Houses to be Lord General of the Forces raised, and to be raised, for the Safety of the King, Kingdom, and Parliament; and all such Persons as have any Place, Office, or Trust, within the said Isle, or any the Forts or Castles there, and all other His Majesty's loving Subjects, are hereby required to yield Obedience, and to be assisting, to the said Earl of Pembroke, accordingly." "It is therefore this Day Ordered, by the Lords and Commons, That the Mayor, Aldermen, and all other the Inhabitants of the Town of Boston, shall be aiding and assisting, from Time to Time, unto the said Captain Syler and his Soldiers in this Service, which is so useful and acceptable to the Commonwealth; and as they have already expressed their good Affection to the Commonwealth, in refusing some Forces heretofore offered to be billeted amongst them, which is allowed and approved of by both Houses of Parliament, so they are hereby required not to suffer any Forces of Horse or Foot to come into the said Town, to reside or to be billeted there, but such as shall be allowed of by the Lord Willoughbie of Parrham, Lord Lieutenant of that County; and, in case any such Forces of Horse or Foot shall be imposed upon them, that it is lawful for the said Captain Syler and his Soldiers, and all other Persons whatsoever within the Parts adjacent, to make Opposition thereunto; and they shall, in so doing, be saved harmless and indemnified, by both Houses of Parliament." 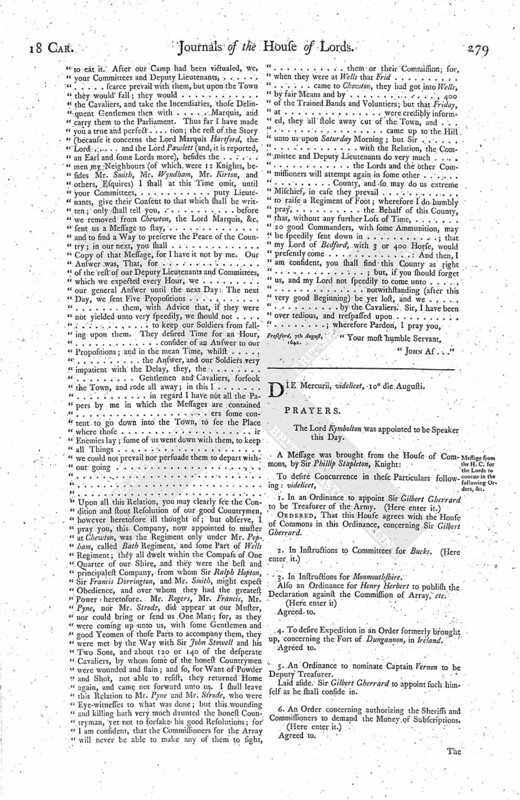 "Whereas, by Force of an Act made this present Parliament, divers Sums of Money, as well Gifts as Loans, have, for and towards the Relief of the distressed Protestants in Ireland, been received and collected, by divers Churchwardens, Overseers of the Poor, High Constables, Sheriffs, and Commissioners, in that Act named, who, by that Act, ought to have paid the same over out of their Hands, and to have delivered Notes in Writing of the Names of the Givers and Lenders thereof, before the First Day of July now last past, in such Manner as in that Act is expressed, so that thereby all the same Monies might, before the said First Day of July, have come into the Hands of the Treasurers in that Act named; nevertheless is not yet done in divers Places: It is therefore now Ordered, by the Lords and Commons in Parliament assembled, That all such of the said Commissioners, Sheriffs, High Constables, Churchwardens, and Overseers of the Poor, as now have any of the said Monies in their Hands, shall forthwith, with all convenient Speed, pay over the same, and deliver Notes in Writing of the Names of the Givers or Lenders thereof, immediately, unto the said Treasurers, or some or One of them, who are hereby enjoined to give several Acquittances to them who shall pay those Monies; and those Acquittances shall be unto them sufficient Discharges in that Behalf." "Whereas credible Information hath been given, that the Fort of Duncannon, in the Kingdom of Ireland, is in great Distress, for Want of a competent Number of Men to guard the same: It is therefore, by virtue of an Act of Parliament made this present Session (intituled, An Act for the speedy and effectual reducing of the Rebels in His Majesty's Kingdom of Ireland, to the due Obedience of His Majesty and the Crown of England), this Day Ordered and Ordained, by the Lords and Commons in Parliament, That John Bunbury, Gentleman, or his Deputy (who are hereby authorized thereunto), shall forthwith levy and raise, or cause to be levied and raised, within the City of Bristoll, or Parts adjacent thereunto, One Hundred Soldiers, Voluntiers, by Way of Recruit, to be by him conducted to the said Fort with all possible Speed, and to be put under the Command of the Lord Esmond, Governor of the said Fort, for the Defence thereof: And we do hereby likewise require the Mayor of the said City, to provide Shipping and other Necessaries for the speedy Transportation of the said One Hundred Men: And we do charge and require, as well the said Mayor, as all Sheriffs, Constables, and other Officers, and all other His Majesty's Subjects, to be aiding and assisting to the said John Bunbury, in the Performance of the Premises, as they will answer the contrary at their Perils: And it is lastly Ordered, That Mr. Loftus shall forthwith deliver unto the said John Bunbury, by Way of Imprest, the Sum of One Hundred Pounds, to be employed for the Levying and Transportation of the said Men. "Resolved, To move the Lords to join herein." "The Lords and Commons in this present Parliament, reposing special Trust and Confidence in the approved Wisdom and Fidelity of Sir Guilbert Gerrard, Baronet, do hereby nominate and appoint the said Sir Guilbert Gerrard to be Treasurer of the Army, ordered and appointed by the said Lords and Commons to be forthwith raised, for the Safety of the King's Person, the Defence of both Houses of Parliament, and of those who have obeyed their Orders and Commands, and for the Preservation of the true Religion, the Laws, Liberties, and Peace of the Kingdom: And the said Lords and Commons do hereby authorize and require the said Sir Guilbert Gerrard, by Virtue and Warrant hereof, out of such Treasure as is already come, or hereafter shall come, to his Hands, for the Purpose aforesaid, to content and pay, from Time to Time, all such particular Sums of Money as, by Warrants or Bills subscribed with the Name of the Person or Persons and Officers hereafter following, shall be required of him, whose said Warrants or Bills, so subscribed, shall be a sufficient Discharge for the said Sir Guilbert Gerrard, at all Times hereafter, in that Behalf, First, The said Sir Guilbert Gerrard shall pay and content to all such Person and Persons all such Sums of Money as shall be directed by Order of both Houses of Parliament: Secondly, He shall content and pay all such Sum and Sums of Money as, by Warrants of the Right Honourable Robert Earl of Essex, whom the said Lords and Commons have appointed to be Captain General of the said Army, or by the Warrants of any other, appointed, or to be appointed, by the said Lords and Commons, to be Captain General of the said Army, or by the Warrants of his or their Lieutenant General of the said Army, in the Absence of the Captain General for the Time being, shall be required of the said Sir Guilbert Gerrard; which said Warrant, or Warrants, with the Hands of the Parties that shall receive the said Monies, shall be his sufficient Discharge in that Behalf: Thirdly, The said Sir Guilbert Gerrard shall content and pay, upon the like Warrants of the said Captain General for the Time being, and in his Absence of his Lieutenant General for the Time being, for Provision for Victuals of the said Army, Carriages, and all other Necessaries thereunto belonging, all such Sums of Money as the said Captain General, or in his Absence his Lieutenant General, shall require of the said Sir Guilbert Gerrard, by his Warrant or Warrants, or Bills subscribed with his Hand; which Bill, so subscribed by the said Captain General for the Time being, and in his Absence by his Lieutenant General, together with the Acquittances of the Persons which shall testify the Receipt thereof, shall be a sufficient Discharge for the said Sir Guilbert Gerrard in that Behalf: Fourthly, The said Sir Guilbert Gerrard shall content and pay all such Sums of Money, in Gross, or otherwise, as shall be required of the said Sir Guilbert Gerrard, by the Warrants or Bills subscribed by the said Captain General for the Time being, or in his Absence by his Lieutenant General, for any Thing or Things which the said Captain General, and in his Absence his Lieutenant General, shall think meet to be provided for the Furniture of the Ordnance, with Munition, Carriages, and all other Necessaries for the same, delivering, by Indenture, the said Monies to such of the principal Officer or Officers of the Ordnance there, as the said Captain General, or in his Absence his Lieutenant General, shall appoint, for which he or they are to render the Parliament, or such as they shall appoint, an Accompt; which Indenture, with the said Bills subscribed by the said Captain General, or in his Absence by his Lieutenant General, shall be a sufficient Discharge unto the said Sir Guilbert Gerrard in that Behalf: Fifthly, The said Sir Guilbert Gerrard shall content and pay, upon the like Warrants or Bills of the said Captain General for the Time being, and in his Absence of his Lieutenant General, all such Sums of Money as shall be required of the said Sir Guilbert Gerrard, for Coat, Conduct, Transportation, Payment of Dues and Wages to the said Captain General, and his Lieutenant General, and all other Counsellors, Officers, and Captains, Petty Captains, Soldiers, and all others which shall be waged or listed in the said Army, and for all other Things and Necessaries, with all Manner of Carriages for the same; which Bills or Warrants, so subscribed, shall be his Discharge in that Behalf; and the said Sir Guilbert Gerrard, for and in respect of the said Office, and Execution thereof, shall, by virtue hereof, have Power to make, constitute, and appoint, such Officers and Persons, to be employed under him for the Execution of his said Office, as Sir William Uvedall, Knight, by a Commission under the Great Seal of England, bearing Date the Six and Twentieth of February, Decimo quinto Caroli, had Power and Authority to nominate under him; and for, and in respect of his said Office, and Execution thereof, shall have and receive, for himself and his said Officers, and the Persons by him employed, such Fees and Allowances as by the said Commission are or were appointed unto the said Sir Willm. Uvedall: And the said Lords and Commons do further Declare, That whatsoever Monies he, the said Sir Guilbert Gerrard, shall receive and disburse for the Affairs of the Army, by virtue hereof, according to the Orders and Directions aforesaid, together with the Fees and Allowances abovementioned, upon his Accompt made to such Persons as shall be thereunto authorized by the Commons House of Parliament to receive the same, he shall receive a full Discharge for the same, from both Houses of Parliament; and, by them, he, his Heirs, Executors, Administrators, and Assigns, saved and kept harmless from any further Question or Accompt, to any Person or Persons whatsoever; and, in and about the Performance and Execution of this Service, all His Majesty's Officers and loving Subjects are required to give their best Aid and Assistance to him, the said Sir Guilbert Gerrard, and his Officers under him, as Occasion shall require."